Can you remember the latest time when any Swedish artist was taking American TV with a storm visiting such a huge TV-shows like The Ellen Show and Jimmy Kimmel Live? At least I can't but who else can represent Sweden on international pop-stage better than this amazing lady can do these days? 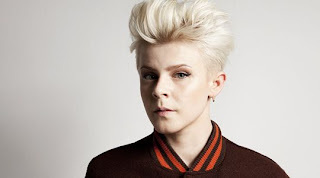 Robyn has appeared recently on these two big shows with both her comeback single of 2010 "Dancing On My Own" and her brand new "Call Your Girlfriend" giving it all like she usually does and getting positive response from the audience, you can enjoy performances right now. Thanx to Pop In Stereo blog for tips.